It was a time of celebration and reflection for the Doctor of Physical Therapy (D.P.T.) 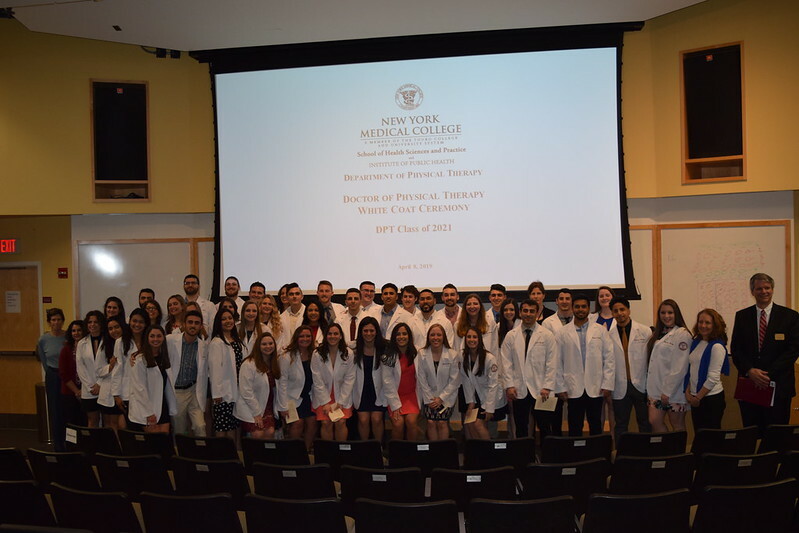 Class of 2021 at the White Coat Ceremony on April 8, marking the transition of their education from the classroom and laboratory into the clinic and affirming their commitment to physical therapy and patient care. Edward C. Halperin, M.D., M.A., chancellor and chief executive officer, offered remarks with a poignant theme that “care” is a verb, not a noun, emphasizing the importance of sensitivity, empathy and advocacy in clinical practice. The theme was echoed by other speakers including Robert W. Amler, M.D., M.B.A., dean of the School of Health Sciences and Practice and vice president for government affairs, Ben C. Watson, Ph.D., vice dean, School of Health Sciences and Practice, Gale J. Lavinder, P.T., Ed.D., assistant professor of physical therapy and director of clinical education and recent alumna Lauren Perillo, P.T., D.P.T. ’12, senior physical therapist at NYU Langone Health. The 41 doctoral candidates comprising the Class of 2021 were cloaked in their white coats by their physical therapy faculty professional development advisors, before reciting the American Physical Therapy Association's Pledge for Physical Therapy. “It was a day of pride, accomplishment, and mindfulness for all in attendance,” said Dr. Majsak.